Those of us who have kept chameleons for more than a year or two often find ourselves in the position of answering questions from first-time chameleon owners regarding the poor health of a newly acquired animal. More often than not, the problems can be traced to poor advice given by the seller or by other novices who assume that because their own chameleon has survived for 6 months, they must be doing everything right. I have set about to write this article to expose some of the more common myths, particularly those that contribute to the premature deaths of large numbers of chameleons. My chameleon is a desert chameleon and, therefore, doesn't need much water. Fact: Even those chameleons that come from regions with annual droughts or which hail from areas with names such as the "Spiny Desert" or from the Arabian Peninsula have heavy hydration requirements and require the same extended periods of misting and dripping as most other chameleons. 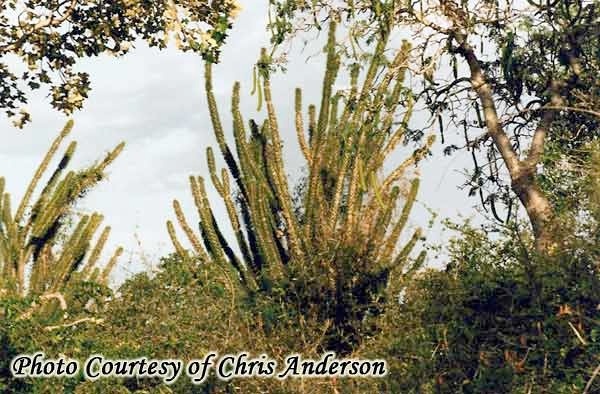 This myth is often applied to species such as Chamaeleo calyptratus, Furcifer verrucosus and Furcifer oustaleti but I have also heard it said of North African and sub-Saharan species such as Chamaeleo quilensis, senegalensis, chamaeleon, and gracilis. Even when there are periods of drought, there is typically heavy daily dewing and the chameleon has available water for several hours per day. This must be duplicated in captivity with extensive dripping and misting. The keeper would be well advised to grasp the concept of "microhabitat selection." Just because humans can live in the Sahara desert doesn't mean that they can sit out in the desert sun all day. And just because Eskimos live in the arctic doesn't mean that they can survive constant exposure to those conditions. They survive in spite of those conditions, not because of them. They seek out microhabitats with more hospitable conditions. And just because a chameleon lives in an arid region does not mean that it likes those conditions. When the temperature rises and the humidity falls, the animal will typically retreat to crevasses and hollows in trees and rocks where it is cooler and more humid. It is the keeper's job to mimic the microhabitats which the animal seeks out, not necessarily the more global habitat with which it is trying to cope. The misting is important not only for hydration but also to permit the chameleon to wash its eyes, a crucial behavior for maintaining the all important visual system. Misting is also important for avoiding dysecdysis (abnormal or difficult shedding). While it is true that many of these so-called desert species don't tolerate "wet feet" very well, that simply means that the cage should have a chance to dry out between waterings. It does not mean that water requirements are minimal. In fact, many so-called "montane rain forest" species have the same requirements for a dry cage at least part of the day. For example, C. jacksonii is notoriously sensitive to foot infections if the cage is kept constantly wet. When providing a dripper, use as large a dripper as possible. A one or two gallon dripper is ideal. A paper cup with a few holes in the bottom may be used on occasion but it is not suitable for long-term hydration. Similarly, permitting an ice cube to melt on the cage top is unacceptable as a part of long-term care. The water so produced is simply too cold to be attractive to the animal and the drip rate is often too slow to attract many of the more reticent drinkers. A drip rate of 2-3 drops per second is often required to stimulate drinking in some animals. The lush Spiny Desert. Ifaty, Madagascar. Photo courtesy of Chris Anderson. Furcifer verrucosus habitat, Beza Mahafaly, Madagascar. Photo courtesy of Chris Anderson. Myth #2: Your chameleon will happily drink from a bowl and you don’t need that messy dripping or misting regimen. I heard this one most recently from a vendor at a herp show who was pushing baby calyptratus on poor, unsuspecting impulse buyers. Fact: Chameleons rarely drink from standing water. Drip and mist systems are a must. If your chameleon is drinking too readily from a bowl it is usually a sign that he is dying a slow death from “chronic suboptimal hydration” (CSH). Granted, there is the odd chameleon that seems to drink readily from a bowl even if well hydrated but that is a great rarity. It is far more likely that your chameleon is slowly dying of thirst. CSH is, in my opinion, the single greatest factor contributing to the premature deaths of captive chameleons. Without proper misting and dripping the chameleon cannot wash its eyes, leading to eye infections. Without adequate hydration the kidneys cannot function properly and will shut down in the face of the all-too-common problem of over-supplementation with vitamins, calcium, etc. Without adequate hydration, dysecdysis becomes an early sign of more serious underlying problems. By stressing the system, CSH will exacerbate just about every problem a chameleon can face. And finally, a water bowl is a breeding ground for bacteria. If not disinfected daily it will be a source of chronic illness. The same is true for waterfalls. Additionally, waterfalls are that much harder to clean and disinfect. The vast majority of experienced keepers and breeders eschew both bowls and fountains. Myth #3: Chameleons can be kept in small groups rather than individual cages. Fact: Very few chameleons will tolerate the presence of conspecifics. A few of the tiny members of the genera Rhampholeon and Brookesia are notable exceptions but even then, two adult males should not be housed together. Virtually of the commonly kept species such as the jacksonii, pardalis, calyptratus, quadricornis, melleri, deremensis, lateralis, gracilis, dilepis, and even the tiny ellioti, require individual housing and this means visual as well as physical isolation from other chameleons. To the eye of the novice two chameleons might appear to be getting along but the stress is there and the result will be an early death. 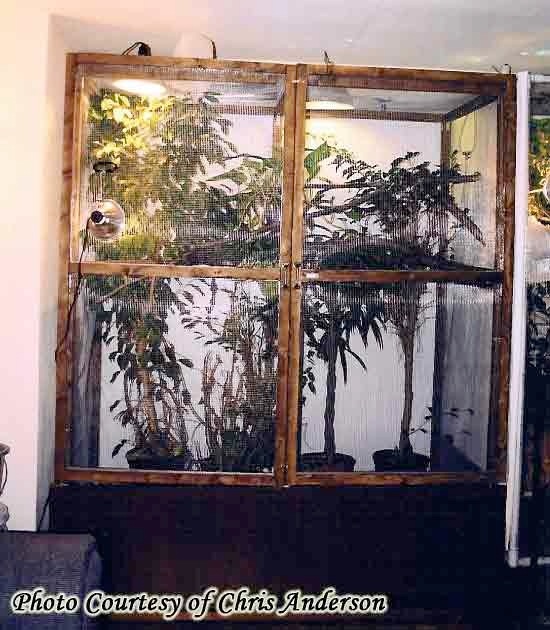 If you can provide a large, walk-in type cage, you might get away with it for some species but this is rarely an option for novices and should only be attempted by those with extensive experience in chameleon husbandry. Only experience lets you identify the subtle symptoms of chronic stress before it’s too late. Myth #4: Chameleons require frequent supplementation with commercial preparations of vitamins and minerals. Fact: If your prey items are properly gut loaded and the proper UVB lighting provided, your chameleons will need only light, infrequent supplementation. See the excellent articles by Dr. Ken Lopez at http://www.chameleonjournals.com/vet/. Dr. Lopez believes that excessive supplementation is now a far more frequent cause of chameleon mortality and morbidity than is vitamin or mineral deficiency. Most of the commercially available gut loads are little more than grains. Perhaps the best gut load is the James, Wells, Lopez Gutload Recipe. If you opt for a commercial gutload, make sure it has most of the ingredients described in this recipe. When supplementing your chameleons, make sure you understand the difference between vitamins and minerals and understand that any of these things may be toxic at high doses. Avoid coating your prey until they are caked with powder. The very lightest dusting is all you need. Supplements are often required no more than once every 2-4 weeks. There may be exceptions for certain minerals (e.g., calcium) for certain animals at certain times (e.g., when a female is recovering from egg-laying or when a baby is growing rapidly). You also need to be aware that there are radical differences among the various available supplements. Some are only minerals. Some have vitamins. Some are calcium only while others contain calcium plus vitamin D3. Some have preformed vitamin A (hard on the liver) while others use beta carotene (a vitamin A precursor). So pay close attention to the contents of the supplement, read the articles mentioned above, and supplement intelligently. More isn’t necessarily better and it may be fatal. Myth #5: I can just put my chameleon into a glass tank and that will keep the humidity up (so I don’t have to have an extensive mist and drip system). 1) Glass does not permit the proper air flow that chameleons require. Stale air increases the risk of respiratory infection. 2) Glass does not permit the proper temperature gradient. A chameleon needs to be able to choose his own preferred temperature. In a screen or wire cage, this gradient is often as much as 30º F, from 95º at the basking spot to 65º at the farther reaches of the cage. Such a gradient is simply not possible in a glass aquarium. 3) It is nearly impossible to provide a chameleon with the proper hydration in a glass aquarium lacking drainage. Ideally, the chameleon should be getting misted for 5-minutes at a time and have a ripper available 3-8 hours per day. The amount of water that would accumulate in a glass tank would be totally unacceptable. If you are worried about keeping humidity high, use a room humidifier (never blow the fog directly on the chameleon) and plant your cage heavily with living, potted plants. A related myth is that you should have a substrate in the cage to help keep humidity up as well as for aesthetic reasons. The fact is that substrates can be accidentally ingested and cause intestinal obstructions, often with tragic consequences. Do not below claims that a substrate is “digestible.” Such claims are invariably false, at least when chameleons are concerned. A bare floor or newspaper, or paper toweling is preferred. Myth #6: Superworms will eat their way through a chameleon’s stomach. Fact: The stories one hears about superworms eating through a chameleon’s stomach are simply apocryphal. Superworms (Zophobas morio) are extremely sensitive to water and drown within minutes. It would be virtually impossible for a superworm to survive long enough in the digestive tract to do any damage even if swallowed whole. And because the chameleon almost invariably gives it a crushing bite before swallowing, the superworm rarely has enough time to drown. The rare story in which someone witnesses a superworm exiting the body of a dead chameleon almost certainly represents a case where the insect entered the body of an already dead or dying animal. Myth #7: Don’t let the temperatures vary at night. Fact: Chameleons prefer (and typically require) a temperature drop at night. This drop should be at least 10º-15º F for most of the commonly held species (i.e., jacksonii, pardalis, calyptratus, dilepis and gracilis). These species can easily tolerate night time temperatures into the 60s and often much lower as long as they can warm up during the day. Consequently, night lights, heat rocks, etc., should be avoided at all costs. Myth #8: All your chameleon needs is some crickets or maybe some meal worms. Fact: Variety in prey items is one of the keys to chameleon health and longevity. Crickets are certainly an excellent prey item and are the most commonly fed staple of the diet. Meal worms (Tenebrio molitor) are actually considered a poor source of nutrition as their bodies are too chitinous. Certainly they may be fed as an occasional treat but superworms (Zophobas morio) are a much preferred prey item that can and should be fed more frequently. Superworms are now commonly available in a range of different sizes. Additional prey that can be used to increase variety in the diet include silkworms, wax worms (Galleria mellonella), houseflies, fruit flies (Drosophila hydeii and D. melanogaster), stick insects (i.e., phasmids), mantids, and a host of wild-caught “field plankton”. Green katydids seem to evoke particularly strong feeding responses. Land snails, slugs, and pill bugs are other treats that may be used when available. Of course, any invertebrates collected in the wild should be from insecticide-, herbicide-, and molluscacide-free areas. The feeding of vertebrate prey (primarily pinkie mice, newly hatched finches, and anoles) to the larger species of chameleons remains a controversial practice. Large chameleons undoubtedly eat the occasional nestling bird or small lizard in the wild. Even medium sized chameleons such as the feral Ch. jacksonii xantholophus of Hawaii are known to eat some of the local species of gecko and skink (M. Lovein, personal communication). However, it is unlikely that even the largest chameleons ever eat mammalian prey in their native habitats. 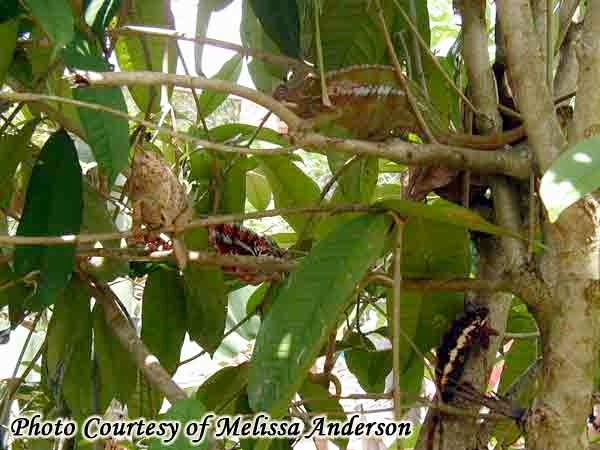 Care also needs to be taken when feeding strange insects, especially those that are brightly colored as such “aposematic” coloration is often a signal to predators that the species in question is unpalatable or toxic. That is certainly the case with many species of ladybugs (i.e., ladybird beetles) and fireflies. Some species appreciate and possibly require some vegetable matter in their diet once they reach adulthood. Of the commonly kept species, this is certainly true of Ch. calyptratus which appreciates a variety of greens, fruits, and vegetables. Myth #9: An unmated female does not require a laying site. A related myth is that an unmated female will die from dystocia and must, therefore, be mated as soon as possible. Fact: All oviparous females, whether mated or unmated, require a place to lay their eggs. Failure to provide an acceptable site can result in egg retention (dystocia) and death. Whether the eggs have been fertilized or not is irrelevant. The fact that many people believe that an unmated female does not require a laying site almost certainly led to the associated myth that an unmated female will necessarily die from dystocia. The truth is that as long as they are provided with a proper laying site, unmated females will do just fine. 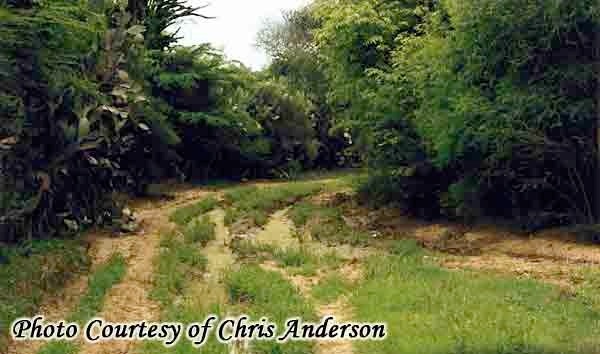 It needs to be emphasized that a “proper laying site” is one that includes privacy. Constant observation of a female during the process of digging and laying can also lead to dystocia. That being said, the stresses associated with reproduction mean that the novice chameleon owner is well advised to begin with a male. Myth #10: Live-bearing (ovoviviparous) chameleons do not suffer the same reproductive problems (i.e., dystocia) as do egg-laying (i.e., oviparous) chameleons. A related myth is that live-bearers are easier to breed than egg-layers. Fact: While it is true that (by definition) ovoviviparous females cannot suffer from “egg retention” they can still retain embryos so the effect can be precisely the same as classic dystocia. Mortalities among gravid ovovivipares may be as high as in gravid ovipares if proper husbandry is not practiced. Remember that a live-bearer is essentially allowing the eggs to incubate in her body so the time from ovulation to the birth will be much longer than the time from ovulation to laying in an oviparous chameleon. Additionally, while live-bearers may not require the nerve wracking wait of many months while the eggs are incubating, the babies are often more delicate and mortality rates can be quite high, often much higher than in the egg-layers. Myth #11: All your chameleon needs is broad spectrum lighting. Fact: Chameleons require special lighting that provides adequate levels of Ultraviolet B (UVB) radiation. UVB is necessary for the formation of vitamin D and chameleons require vitamin D to utilize calcium and other minerals. Without it, they develop metabolic bone disease. In theory, the vitamin D could be supplied in the diet but excessive vitamin D is quite toxic so proper UVB exposure is the best solution. Many people assume that if a bulb is labeled as a “broad spectrum” bulb that it must, therefore, provide UVB in adequate amounts. This is not the case. Broad spectrum bulbs provide a broad range of wavelengths but principally in the visual spectrum. This is because they are meant primarily to provide the best light for viewing your animals. But the wavelength of UVB is shorter than that of visible light. The bottom line is that chameleons require lights that are specifically designed to produce adequate levels of UVB. Myth #12: Chameleons should be handled frequently so they become friendly when they are older. Fact: Chameleons should be regarded as strictly “look but do not touch” animals. Some, such as veiled chameleons are typically quite aggressive and can give a painful (although rarely very injurious) bite. Others rarely bite. Nevertheless, chameleons are solitary animals and handling is invariably stressful. Constant handling is a stressor that evokes the secretion of various hormones that, among other things, inhibit the body’s immune system. The result can be a dramatically shortened lifespan. 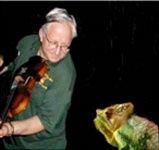 New keepers often say such things as “But my chameleon likes me! Whenever I open the cage he climbs out to me and crawls up my arm.” Such statements are a prime example of anthropomorphizing our chameleons’ behavior, i.e., of attributing human motivations and emotions to our animals. There is virtually no scientific evidence that a solitary-living animal such as a chameleon forms any sort of affectionate bond with another chameleon, much less with a member of a large, strange primate species such as Homo sapiens. Neither is there evidence that early handling will make an animal less aggressive. Certainly, hand feeding a chameleon will teach him to associate you with food and might even cause him to approach you when the cage door opens. But it does not facilitate the formation of a “bond” and it likely does not reduce the stress of handling. 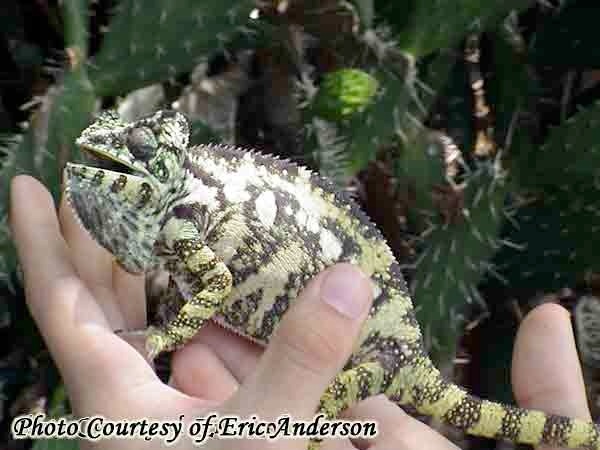 Certainly there are some chameleons that react less aggressively to handling but that is not evidence that the chameleon enjoys being handled or that the handling has no deleterious effects on chameleon health. Chameleons, like every other living organism, exhibit behavioral differences. But to believe that early handling changes the animal’s personality is to confuse an anecdotal tale with scientific proof. The fact is that virtually all long-term keepers, whose animals routinely live to ripe old ages, avoid handling their animals except when cage cleaning or other maintenance issues require it. Ed Pollak is a professor of psychology at West Chester University of Pennsylvania where he teaches animal behavior and biological psychology. An animal enthusiast since childhood, he has published scientific articles on the behavioral biology of mammals and fish and serves as editor of www.adcham.com. For a brief survey of his varied interests see http://mywebpages.comcast.net/epollak/home.htm.